The Parksville-Qualicum Beach area is part of the UN-recognized Mount Arrowsmith Biosphere Region, in the centre of the Georgia Depression Ecoprovince. The Georgia Depression Ecoprovince is a large basin between the Vancouver Island Mountains and the southern Coast Mountains of the mainland, containing the Salish Sea (which is comprised of the Strait of Georgia, Puget Sound, and the Strait of Juan de Fuca) in British Columbia and Washington State. Our Ecoprovince supports the highest diversity of birds in British Columbia – 90% of all species known to occur in the Province and 60% of the species that breed in British Columbia. 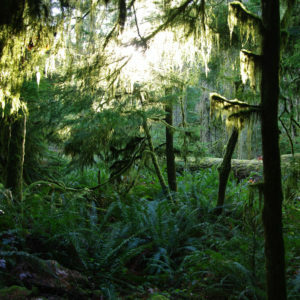 Vegetatively, the biogeoclimatic zone near the coast is the moist Maritime Coastal Douglas-fir. 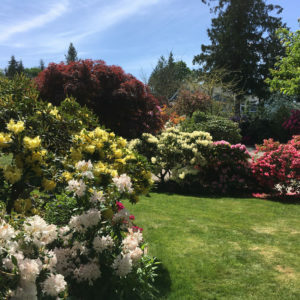 We are centred on the eastern side of Vancouver Island in an area known as the Eastern Vancouver Island Ecoregion, which is an area of reduced rainfall leeward of the Vancouver Island mountain ranges. After moving over these ranges, surface air flow is level or subsiding, creating clearer and drier conditions than in coastal areas adjacent to the open Pacific Ocean. We are one of the sunniest areas in British Columbia, with about 40% of daylight hours in bright sunshine (about 2000 hours of bright sunshine during a year) and about 300 days annually with any amount of measurable sunshine. Our temperatures are the mildest in Canada, being modified by the ocean. The climate is similar to that found in the Mediterranean, with winters at sea level usually only below freezing at most for a few weeks each year. Snow does not fall every year at sea level, but because of the great amount of snow which accumulates on the mountains, Vancouver Island has the lowest treeline in the Province. As in all mountainous areas, conditions vary greatly with altitude, and with Mt. Arrowsmith’s peak (1816 m) only 18 km from the coast, microclimate gardening conditions can vary greatly over even short distances. Using the USDA Hardiness Zone map, we are mostly in Zone 8, with a few areas of Zone 9 along the coast of the Salish Sea. Canada uses a more complex plant hardiness zone system based on winter minimum temperatures, summer high temperatures, length of growing season, humidity and rainfall patterns, which are discussed in the following whitepaper: Jamieson, Glen. 2013. Plant Hardiness Zones. 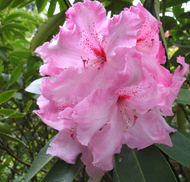 J. American Rhodo. Soc. 67: 71-84. Our zone is one of the smallest in the West, and is influenced not only by the ocean but also by the continental air mass. No zone better grows perennials and bulbs, and it is great for woodland and rock plants. 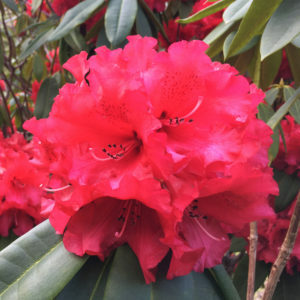 Our next event is the MARS Rhodo Show and Plant Sale! Click here for more information. Click here to learn more about membership in MARS. Click here to get the latest news and enjoy gorgeous photos on the MARS Facebook page! We're proud to contribute to Milner Gardens & Woodland, and Milner Gardens offers MARS members a 10% discount on Milner Gardens memberships.